Learn how to make a weighted blanket for anxiety, including a video on why weighted blankets help! Have you hear about weighted blankets for anxiety? 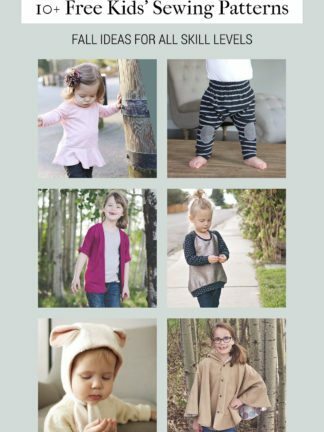 A lot of people find them super helpful — adults and children alike. There are all sorts of treatments for anxiety, from therapy and medication to exercise and meditation and aromatherapy or even a bubble bath. I was pretty excited to hear about weighted blankets for anxiety because besides a hot bath, there’s not much I love more when I’m feeling really anxious than curling up under the sheets with a book. 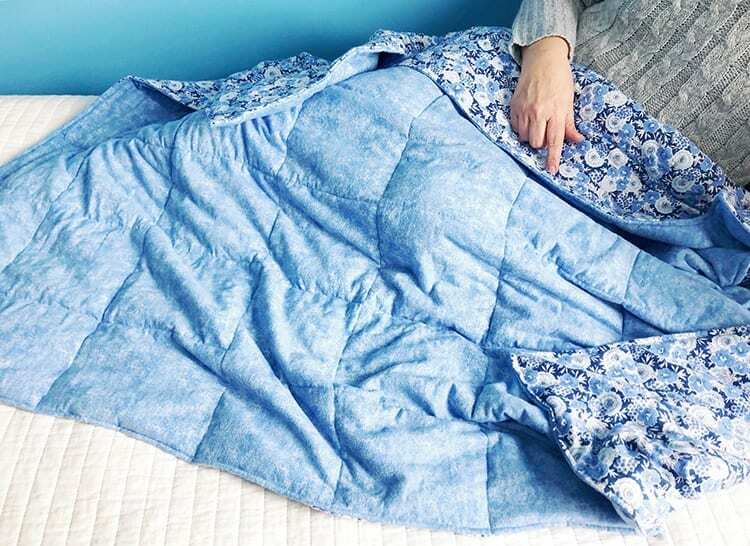 How Does a DIY Weighted Blanket for Anxiety Work? I’m no expert, you guys. You should always discuss things like this with a healthcare professional. But here’s an article on why you should use a weighted blanket for anxiety. They say it can help lower your cortisol (stress hormone) levels by “grounding” your body during sleep. Essentially, by weighing you down, it could help your body physically relax and then mentally relax when the accompanying stress hormone decrease kicks in. After reading all that, are you as excited as I am to give it a try? Not Ready to Make a Weighted Blanket Yourself? If learning how to sew a weighted blanket for anxiety seems a bit daunting, that’s okay. You can always buy one. The only thing is that weighted blankets can get really pricey. Be sure to read reviews if you’re going to invest in an expensive one. Have fun and go crazy picking out the fabric for this. You could do the same fabric on both sides, but it’s fun to mix and match, too! The supply list contains affiliate links, so I may make a small commission at no additional charge to you. Weighted pellets: Amount depends on weight of blanket. See instructions to calculate the right amount. You only need poly OR glass, not both. They’re both machine-washable. 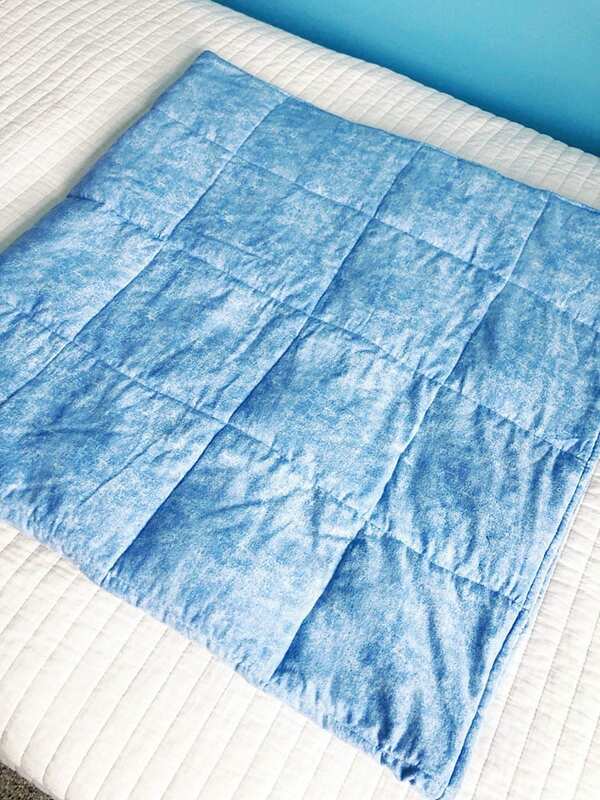 *The quilt batting will make your blanket more durable, but you could try leaving it out if you want something less hot. 1. Wash and dry both pieces of flannel and cut off any loose strings. 2. 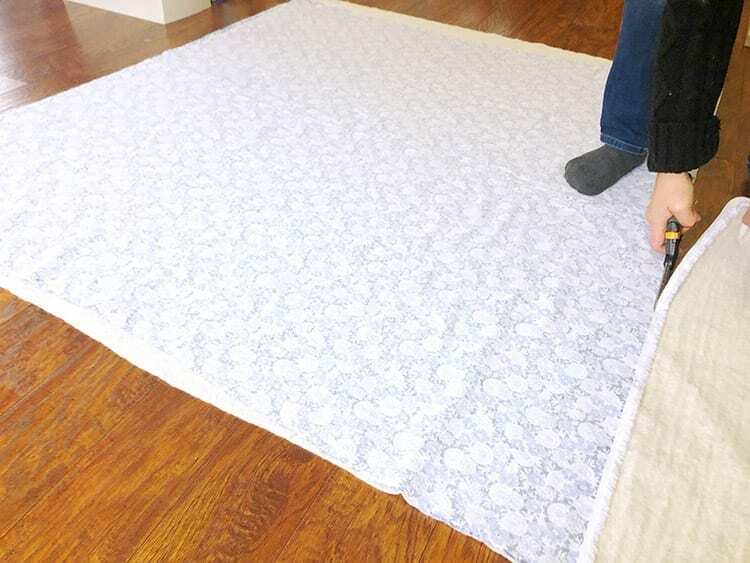 Lay out the flannel and cut each piece into a 52″ x 52” square. 3. 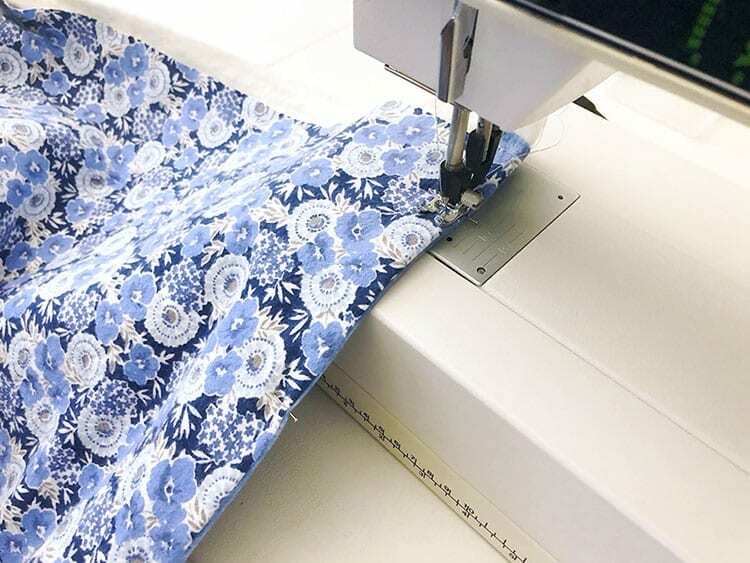 Cut your quilt batting into a 52″ x 52″ square. 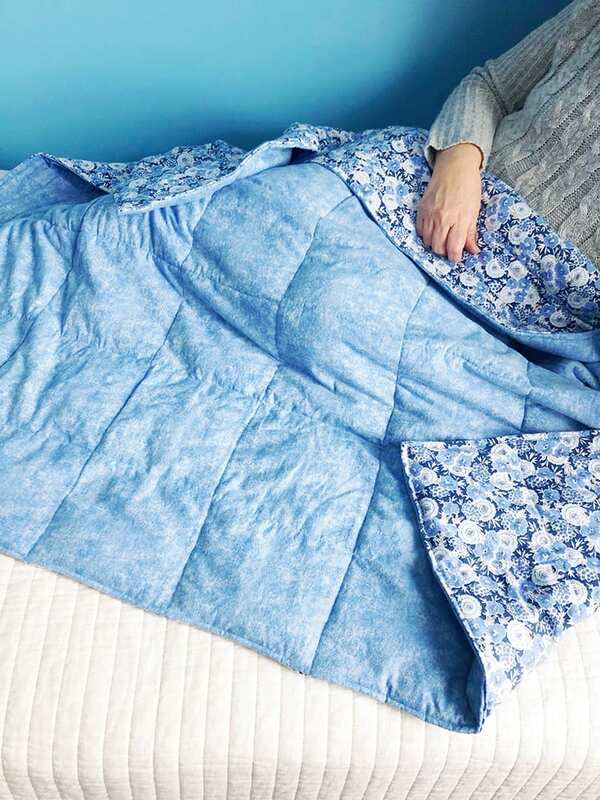 Tip: The quilt batting will make the blanket sturdier and warmer. If you want it to be really lightweight and aren’t as worried about durability, you could try to omit the batting. 4. 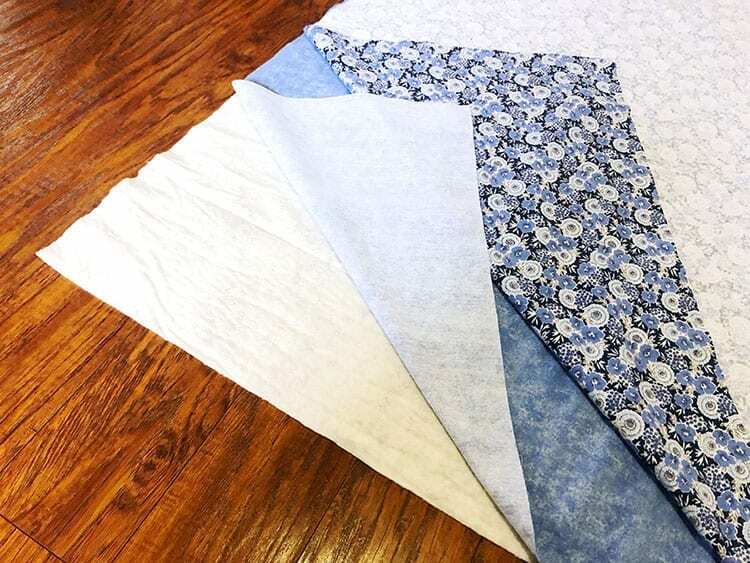 Lay all pieces of fabric on top of each other: first quilt batting on the bottom, then the solid-colored flannel face-up, and finally the patterned flannel face-down on top of the stack. 5. Make sure all 3 pieces are the same size, and if not, measure and cut off any uneven sides. 6. Pin three of the four sides of the blanket together, one at a time, leaving one end open, like a pillowcase. 7. 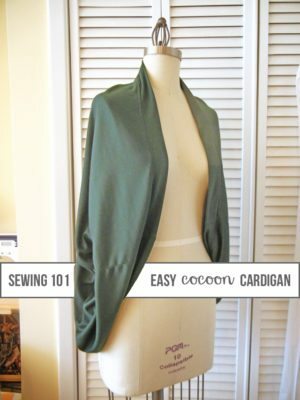 Sew the three pieces of fabric together on the three pinned sides one at a time using a straight stitch. And make sure to back-stitch at each end. 8. Your blanket should now look look a stitched pillowcase. Flip it right-side-out from the open side that hasn’t been sewn yet. 9. You should now have a pattern on top, quilt batting inside, and a solid color on the bottom. 10. Make sure the edges/corners are smooth and flat (use an iron if needed). 11. Next, top-stitch along the the sides that were previously sewn on the top of the fabric for a decorative look and to stabilize the pieces together. 12. Then you should lay your blanket flat. 13. With the opening as the top of your blanket, measure the width of your fabric from top stitch to top stitch and divide that number by eight. This is how wide your eight columns will be. Do the same for the rows. 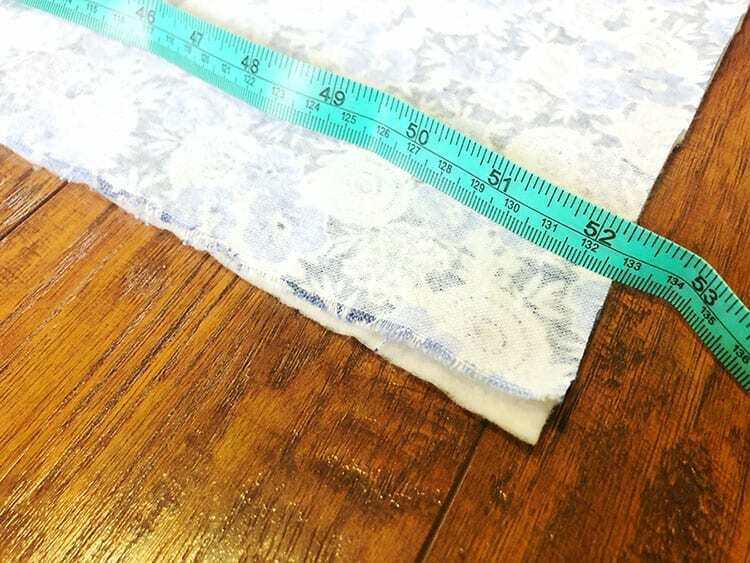 Mine were 6.375” wide, but yours may slightly differ depending on the how close you sewed towards the edge. 14. Use a ruler/measuring tape to mark the lines with pins to make even columns. 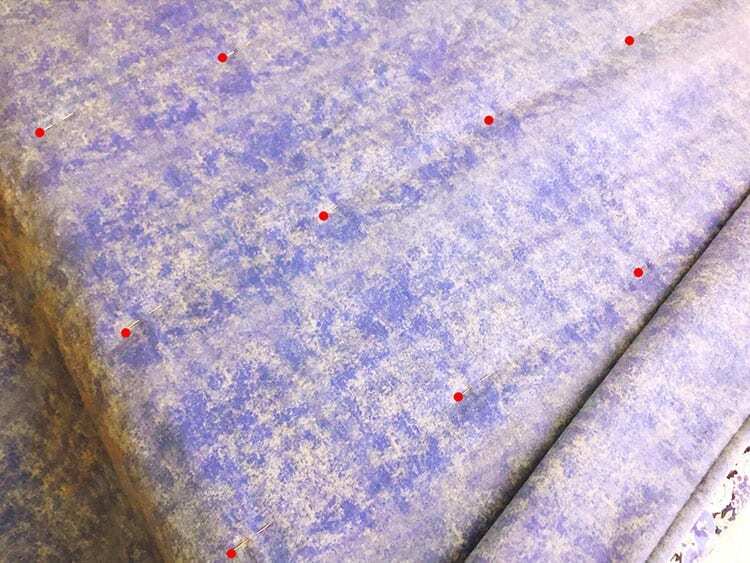 This picture is wonky, and t’s hard to see them in this image, but I marked the heads of the pins with red dots. 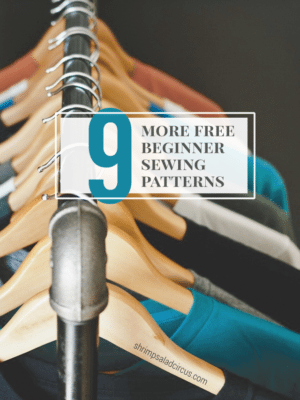 Sew a vertical straight stitch all the way through for each column. 15. Next you will want to figure out the weight you want your blanket. Your blanket should be 5-10% of the weight of the person you are making it for. For example, for a 150-pound person, you want a 7.5-15 pound blanket. Similarly, for a 200-pound adult, 5-10% of their weight would yield a 10-20 pound blanket. This blanket will have 64 squares, so divide the total weight by 64 to calculate how much poly pellet should go into each square. A kitchen scale is great for measuring this. 16. Since this blanket is for a 150-pound person it weighs about 10 pounds. It has approximately 1/2 cup of poly pellets in each square. 17. Slide the cardboard roll into each column, one at a time, and add enough poly pellets for one square. Because this one has 1/2 cup per square, I poured 1/2 cup into each of the eight columns. 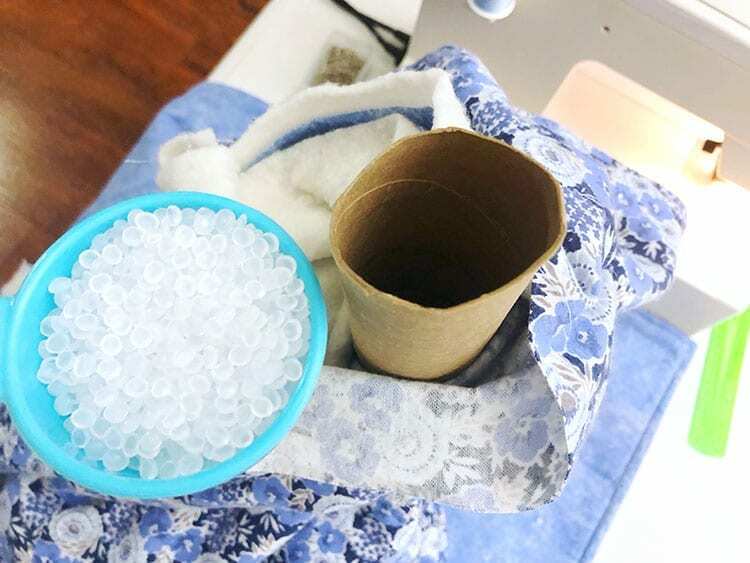 Tip: Above all, make sure you pour the poly pellets in the same side of the blanket each time. I poured them in between the batting and the patterned fabric. 18. Once you’ve added your first set of pellets to each column, then carefully and closely pin the row across using the measurement you calculated in Step 13. Tip: Use a T-square here to make sure your rows are perpendicular to your columns for nice, even squares. Tip: In case you’re having trouble visualizing it, you’re pinning parallel to the bottom of the blanket to enclose the pellets inside the first row of squares. 19. 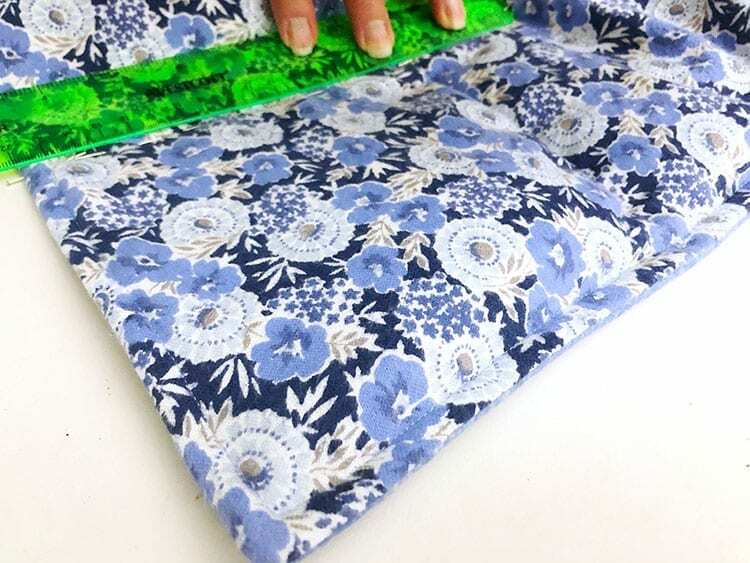 Carefully sew a straight stitch along the line, removing the pins as you go. 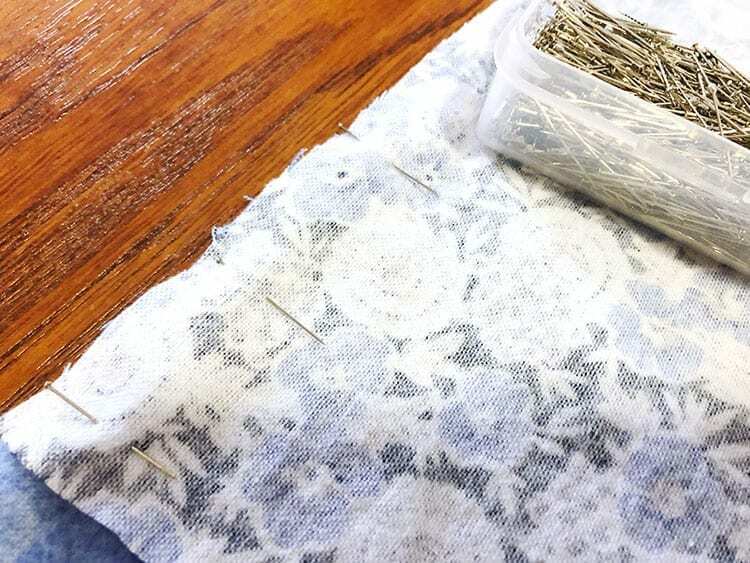 Tip: Try to avoid the pellets because they could break your sewing needle. In other words, use lots of pins to keep the pellets on the proper side of the line. 18. Repeat step 16 until you have 8 rows across and vertically. 19. 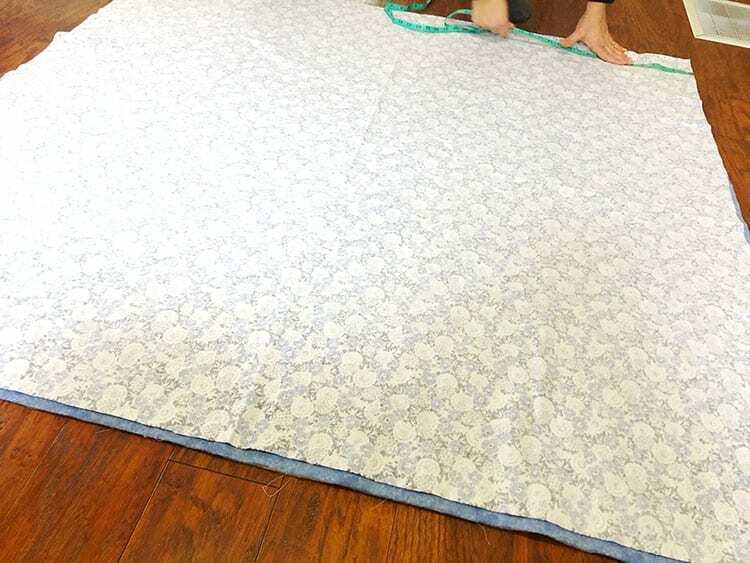 To finish the blanket, fold the fabric on the top of the blanket inward about an inch. Pin it closed, and top stitch across the top of the blanket. 20. Finally, double stitch the top of the blanket so the poly pellets stay in securely. I’m concerned about your instructions. Your eight columns are 6.75″ wide on a 52″ square blanket, so that would mean that each finished square would be 3.?”. If you only used 1/2 cup Poly-Pellets in each of the eight columns, it doesn’t seem to me 1/2 cup Poly-Pellets would be contained in each 3.?” square when the blanket is finished. Am I misreading your instructions? Hi Ella. The columns are 6.75″ wide, and since you’re making squares, the rows are 6.75″ tall. So the squares are 6.75″ x 6.75″. Thank you for these instructions. Ive been needing to get a weughted blanket for my self but didnt know the proper way to fill it. 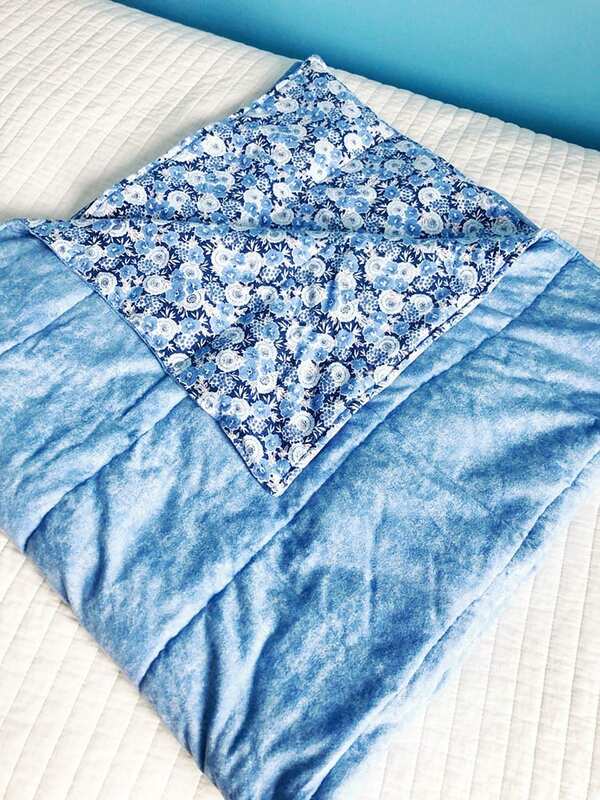 This pattern is exactly how i make baby quilts/lap quilts except i use squares of fabric. Where is the best place to get the poly beads? 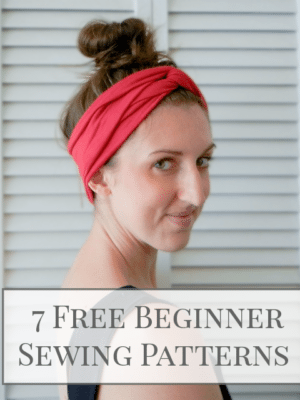 Wonderful and easy instructions, I am so glad to have found this on Pinterest! I am going to make some for my friends who happen to be veterans with anxiety, ptsd, and other problems…I will keep you informed with a later comment…thank you so much! I’m curious to know the price comparison between the DIY version and a purchased weighted blanket. Great question, Melanie! I’d say it’s probably around $65 to make this version. I’m getting ready to make one that’s just fleece on both sides without batting, so that one will be slightly less. I’ve linked to a few purchase options nearish the top of this blog post, but they tend to run in the $100-$250+ range. So you could get a cheap one for not too much more than making it — and less when you consider your time. But if you make it yourself, you can customize the look of it. So it’s whatever you prefer! what are the care instructions for the completed blanket? Hi, Soli! The poly pellets it’s filled with can be machine washed and dried. Just make sure you launder according to the care instructions for whichever fabric you choose. Thank you so much for weighted blanket instructions .. may I ask what type batting you used? I am so anxious to make one of these … Thank you again.